I was fortunate enough to have found a seller who had this ensemble. She's a mother of two whose husband suffered a recent stroke and thus, needed sell the Franklin Mint Gibson Girl's Night at the Opera. I had urged her to check ebay for its actual sale as she would probably have sold it higher there, but still she offered this for me. I had long to have this worn by Scarlett but unfortunately, it would not fit the Tyler body mold. 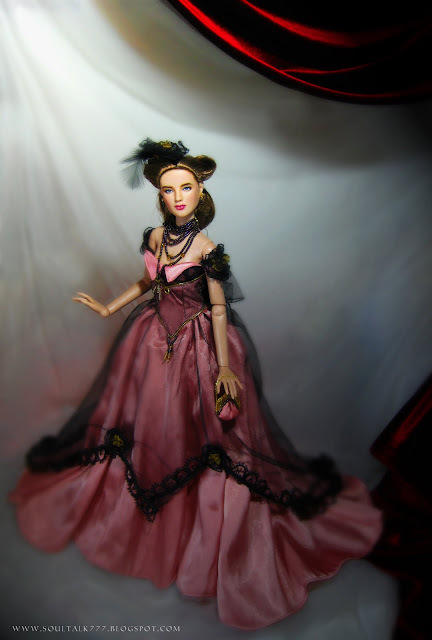 Luckily it was a good enough fit for Tonner Antoinette. I will post more photos on the details of this outfit. Over-all it is rich in texture, details are impeccable (!!) and it it all "in scale". The cloth drapes beautifully and the black soft tulle edged with lace detail adds to the elegance of the doll. She wears a generous amount of beading on her shoulder, necklace and on the feathered hat (I have no idea yet on what to call it). The beads do not look cheap and are "plum" in color. 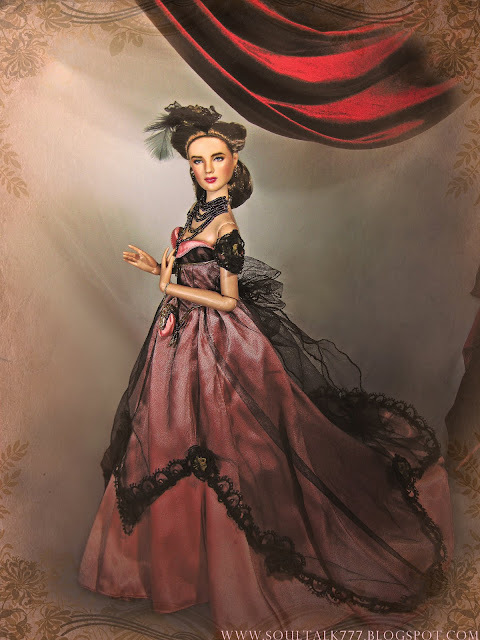 She also comes with dark gloves which do not fit the Tonner doll so I thought of just putting that away (it would've added to the luxurious opera feel though). 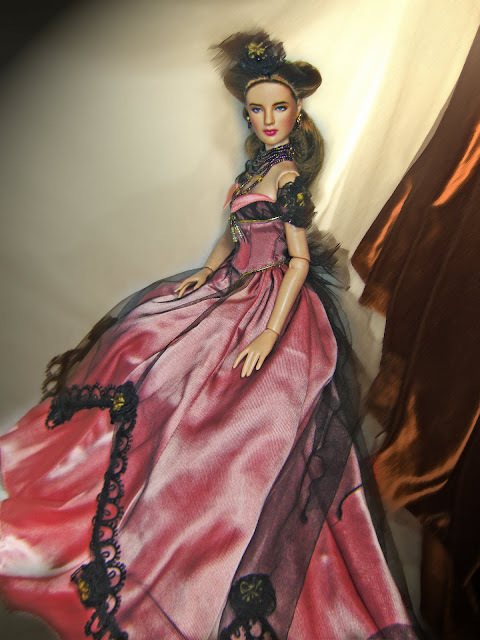 This is truly a testimony of Franklin Mint's reputation in doll dress detail -- the purse is detailed with gold molds and old rose satin. Truly a very vintage feel in every detail. 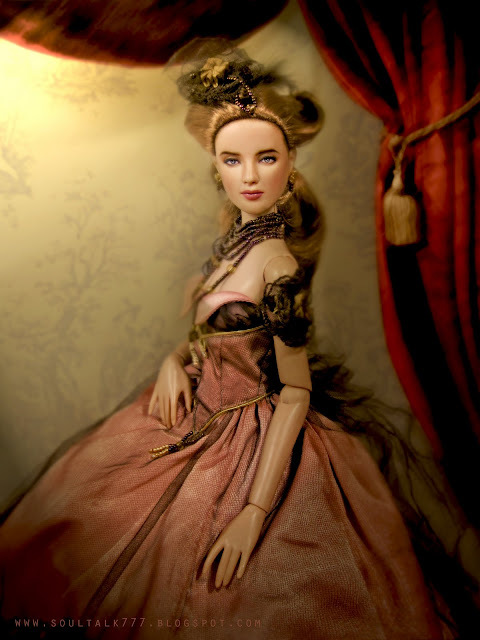 The hair of this doll has been styled just for this photo shoot. 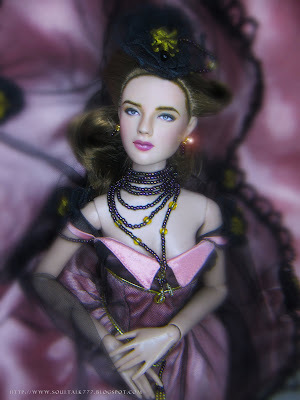 What I truly admire about the Tonner Antoinette mold is the expressions that are possible with its body and hands. She is always picture perfect!